If you live in Minnesota’s Arrowhead region and have picked up a newspaper or tuned in to the local news in the past two years, you are likely well aware of the controversial copper-nickel sulfide mining operation proposed by PolyMet Mining. While the Arrowhead has been known for iron mining since the 1880s, copper mining is considered a new venture in mineral extraction today. But it was the promise of copper—and the wealth that would come from mining it—that spurred the first settlement of the Lake Superior North Shore by non-native Americans in the 1850s. Even then, copper mining was nothing new to the area—though it had long been forgotten. Ancient Native Americans known as the Old Copper peoples once populated Isle Royale and what is now Michigan’s Upper Peninsula, perhaps as long ago as 5,000 BCE and as recently as 1,200 BCE. They extracted copper by heating native rock with fire and then dousing it with cold water, causing the rock to crumble and leaving the copper behind. The very next year U.S. government officials met with Ojibwe leaders at La Pointe on Madeline Island in the Apostle Islands. There they made an agreement known the 1842 Treaty of La Pointe. 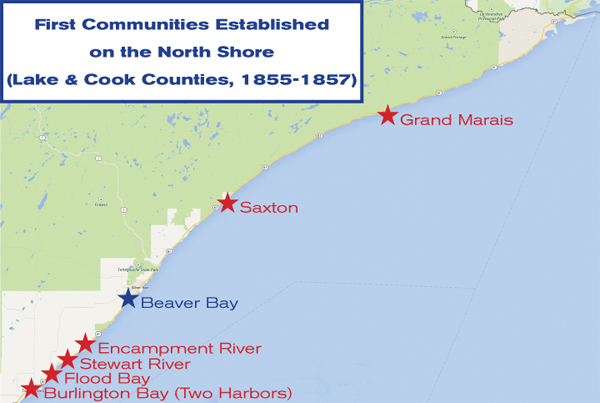 The treaty in part turned over what is now Michigan’s U.P. and Northwestern Wisconsin to the United States, and prospectors rushed to the region in search of copper. By 1844 they were mining it, and an agreement made that year gave Isle Royale to the U.S. as well. From 1845 to 1887, Michigan was the largest source of copper in the U.S., and in 1869 the state produced 95 percent of the nation’s copper. Houghton didn’t see the end result of his discovery. The scientist—who was reluctantly elected mayor of Detroit in 1842—died in October, 1845. He and two companions drowned when their small boat was wrecked on Lake Superior. The success of copper mining along the Lake Superior shore in Michigan got people to thinking: if there are copper deposits along the south shore, shouldn’t there also be copper on the north shore? This idea led to the 1854 Treaty of LaPointe, which in part opened the North Shore of Lake Superior to settlement by U.S. citizens of European descent. With the treaty ratified in 1855, prospectors rushed to the region to make claims. From Portland in what is now Duluth’s east hillside to Grand Marais, dozens of “copper towns” sprung up along the shore, nearly all of them adjacent to the mouth of a river or stream—the same type of geological formations that held copper deposits along the south shore. In 1856 the town of Buchanan—platted by W. G. Cowell and other pioneers and named for sitting President James Buchanan—was established southwest of the mouth of the Knife River. 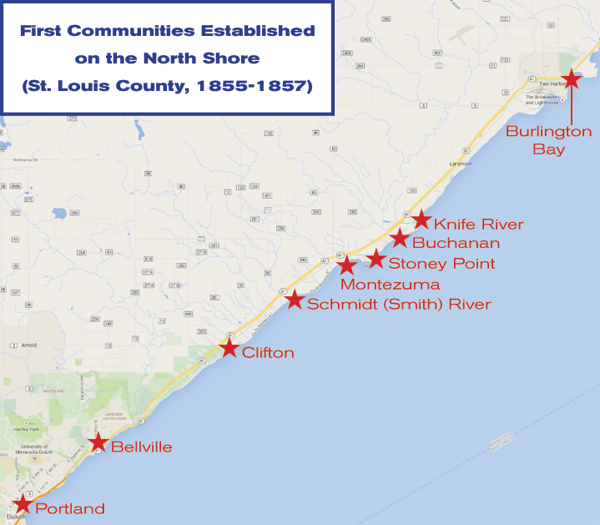 Buchanan was selected as the site for the new U.S. Land office for the Northeast Section of the Territory of Minnesota, and so it became vital to the shore’s development: anyone who wanted to make a land claim along the shore did it at the office in Buchanan. It was thought that the community would soon rival Octonagon, Michigan’s main copper town. Buchanan was technically the third copper town established along the shore, preceded by Clifton near the mouth of the Talmadge River and Montezuma at the mouth of the Sucker River. Clifton—the first townsite on the North Shore—was platted October 31, 1855, by J. S. Watrous. Watrous was ambitious: the plat of his townsite, about nine miles north of Duluth, included two long parallel piers stretching out into Lake Superior to create a large harbor. Since claim-jumping was common, prospectors often hired men to “hold” the property—to camp or build a small cabin on the site in order to hold the claim. One of the men Watrous hired to “hold” Clifton was John Talmadge, who camped along a nearby river, which today is named in his honor. Stretching north from what is now downtown Duluth, so-called copper towns established between 1856 and 1859 included Portland, Bellville (the western-most portion of Lakeside), Schmidt River (named for settler Henry Smith), Clifton, Montezuma along the Sucker River, Stoney Point/Sucker Bay, Buchanan, Knife River, Burlington Bay (part of today’s Two Harbors), Flood Bay, Stewart River (named for settler John Stewart), Encampment River (platted by George Stuntz), Saxton (named for Commodore Horace Saxton), and Grand Marais (platted by Robert McLean and first occupied by trader John Godfrey). The great exception along the north shore was Beaver Bay, settled by the Weiland Brothers and other German immigrants not as a copper town but as a farming and logging community. Many of the men who platted those copper towns had their hands in more than one venture. For instance, Vose Palmer was involved with both Bellville and Montezuma, and W. G. Cowell also owned land in what is today Duluth’s Canal Park. Stuntz—a surveyor by trade—and Saxton were involved with several townsites. Some of these men were part of northeastern Minnesota’s first organized mining outfit, the North Shore Mining Company. Organizers D. S. Cash, W. W. Spaulding, S. C. McQuade, W. W. Kingsbury, R. B. Carlton, Vose Palmer, John Parry, and W. G. Cowell had an authorized capital of $400,000—but the company never mined very much copper. Every other North Shore copper town disappeared as well—most, of course, never existed except on paper. John Godfrey abandoned his trading post at Grand Marais in 1860; the township would spring up again around 1870, when it became a logging center that helped provide the timber that built Duluth. Logging and commercial fishing—not copper mining—drove the north shore economy into the 1920s, when tourism took over. That was the end of copper mining along the north shore. Within a few years the promise of Jay Cooke’s railroad would merge the townships at the Head of the Lakes into a boomtown city named Duluth. In 1869 the promise of gold near Lake Vermilion resulted in a gold rush, and soon pioneers were calling newcomers to the area “Sixty-niners.” Just like copper, the dreams of vast gold mines never came to fruition. But during that wild summer of 1869, several prospectors found evidence of iron deposits that, as we know, became the wellspring that has helped nourish the Arrowhead Region’s economy for more than 130 years. From Greetings from the Arrowhead: The North Shore by Tony Dierckins (Zenith City Press, 2006) featuring over 200 vintage lithographic postcards. Click on the cover to preview the book.